I've been wanting to create a marble effect background for some of my photos for so long now but I just didn't know how to do it until now. This is one blogger bandwagon I am most happy to jump on. I noticed a couple of my favourite bloggers and instagrammers had a sweet marble background in their photos. I wondered how they had done this - whether they genuinely had a marble worktop/table/tray or whether they had crafted their own. Well thanks to my old pal Gemsmaquillage I finally know how to make my own and I thought it would be cool to share this little DIY tutorial with you. You can cover anything you want using this technique and you can also use whichever pattern you fancy, it doesn't have to be marble. The first and most important thing you need to get your hands on is marble contact paper - or as you and I know it as sticky back plastic. Gemma tipped me off that this could be found in Wilkinsons and after searching high and low I finally found it on a stand near the kitchen wares section. The next thing you will need is whatever item you want to cover. It may be a tray to use in your backgrounds or to stand your perfumes on, Nicola transformed an old candle pot into a gorgeous holder for cotton buds. The possibilities are endless and the only limit is your imagination. Depending on what you are covering you will need scissors, maybe a scalpel and a towel or cloth to help you smooth the covering onto the item to ensure you don't get any air bubbles. 1. Get yourself a clear work space and get your materials together. 3. Peel back the adhesive paper backing to show the sticky side and begin to apply it to the tray leaving the inch around the edges to seal around the back. Roll the paper across the tray very slowly and carefully ensuring there are absolutely no air bubbles. You can use a cloth at this point to help you make sure there are no air bubbles. 4. Turn the tray over carefully and fold over the edges. Stick down firmly to make sure the edges are covered nicely. Sweet tutorial! For years I always wished I had a nice table near decent lighting to take pictures on, and recently I learned that it's mostly just wood boards and stuff placed in front of a window haha. 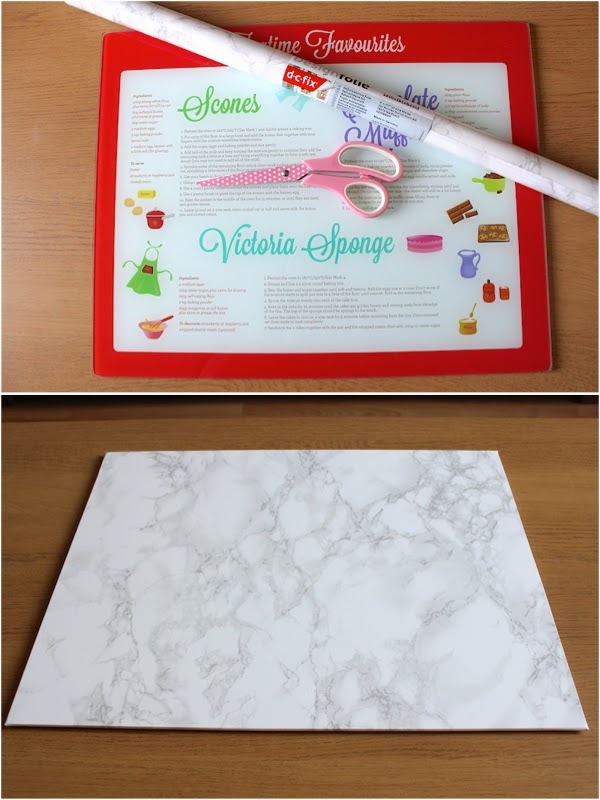 The contact paper looks so realistic, it would have fooled me into thinking it was an actual marble countertop! haha it so is a bandwagon isn't it! I kept seeing pictures... now I have a table, make up table and cleansing tray in MARBLE!! My other half is banning me on covering more stuff in marble!